There was a welcoming buzz in the air when I visited North Bar in Leeds last night. The bar stools were full of folk sitting and chatting to each other or the bar staff, and the tables were crowded with an even mix of clustered regulars, beer geeks, bloggers and young couples. It seems that everybody likes an excuse for a mid-week drink, and last night that all-too-tempting excuse was the launch of Thornbridge’s Keg range. On the adverts for the event the line-up was billed to be Kipling, Wild Swan, Jaipur and Italia, but upon arrival it appeared that the session strength pale ale Wild Swan had been replaced with the breweries polar opposite brew; the heavy weight imperial stout Saint Petersburg. It’s got to be said that Wild Swan is a fine cask ale, a summer thirst quencher or beer garden quaffer, but I wasn’t exactly itching to try it on keg so the Saint Petersburg was a welcome late substitution in my eyes. There’s been a lot said by the likes of Mark Dredge, Tandleman and Pete Brown and many other bloggers about cask vs keg. For me the argument needs to come down to taste not convenience – if the beer tastes better on keg then serve it on keg, if its better on cask then serve it that way, frankly I don’t give a crap about logistics, it’s just about what’s best for the beer. So the question is, how did these beers fare? I started out with a glass of Thornbridge’s 4.8% Pilsner, brewed in collaboration with Maurizio Folli of Birrificio Italiano. Appearance wise it is true to the style, ultra pale and crystal clear. I must admit I’m not a connoisseur of this type of beer, and like many a UK beer lover have been somewhat disenchanted by dull mass-market offerings. This beer is far from average though. It smells slightly lemony-citrus with just a hint of herbal hop aroma. The first taste is refreshing, crisp, and thirst quenching (yes I know these are all classic marketing words for beer with no flavour but that’s not the case here). There’s also a slightly grainy tasting malt backbone that you don’t get with lesser pilsners. It’s a nice beer but not one I’d rush to buy again if it was on the bar. The smell of this 5.2% ‘South Pacific Pale Ale’ is wonderful; pure passion fruit and mango. It’s got that fantastic tropical, juicy, slightly herbal smell that Thornbridge achieve so well. It’s something I love in pale ales so up to this point things are looking good. Thankfully the taste backs up the smell and you get a nice balance of sweet/sour passion fruit which leads into bitter grapefruit in the finish and a dry, floral, herbal, fruity hop aftertaste. On keg it felt relatively light in body and for me was ever so slightly too cold. I think this beer's strength and style represent my turning point where cask would probably just inch it over keg flavourwise. That said, it was still a great beer and on keg would be a perfect beer to get a lager drinking friend into something a bit more adventurous. Jaipur for beginners you could say. I purposely left the Jaipur IPA (5.9%) until after Italia and Kipling because I’ve had it enough times before to know how good it is, and I thought I’d never get to the others if I had it first. Plus I didn’t want to ruin my palate with hops or make the other two pale in comparison, so to speak. 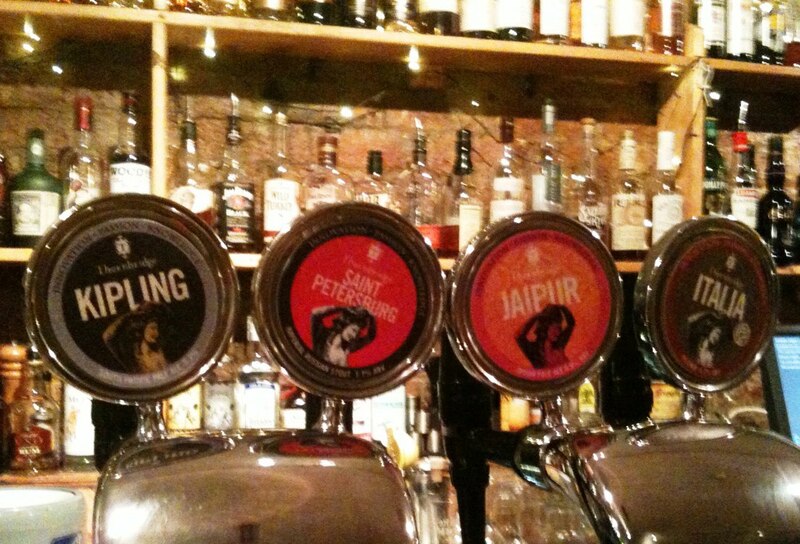 I’ve had Jaipur on cask numerous times, it’s widely available and consistenly good. However I have found that the strength of the hops and that grapefruit bite come through in varying degrees when on cask, which is a little annoying when you fancy a really big hop hit. That wasn't the case here, and this keg was right on the money. In my humble opinion beers of this style and strength just taste better on keg, that sparkle of gas and few degrees extra cooling just bring the beer alive and let those super fresh pithy hops really sing. They were brighter and more orangey, with juicy grapefruit, citrus, orange, mango, passion fruit and a drying edge that balances so well against the slightly sweet body. It was a belter. Perfection on keg and better than nearly every cask version I’ve had. I left a half of this Imperial Stout until last, weighing in at 7.7% and this being a weeknight I thought a pint might be pushing it. I never got around to trying this in any form before so can’t compare the dispense to others, so I'll stick to what’s most important, the flavours. You get a huge hit of rich, dark, roasted espresso coffee on the nose, it dominates and very little in the way of chocolate or other traditional stout aromas come through. The taste again delivers a massive espresso roastyness but there's also a slightly burnt, smoky malt flavour and a very dark bitter chocolate edge as well. There’s also hints of slightly stewed fruit, like a rich mince pie without the spice and a wonderfully fresh late hop bite. For a big beer it manages to be hugely flavoursome, complex and yet refreshing, and the carbonation helps to avoid that cloying mouthfeel some Imperial Stouts display. The relatively cool temperature hides the abv really well but as the beer warms a slight alcohol hum becomes apparent in the aftertaste. Along with that warming alcohol you get a really nice coffee aftertaste that is genuinely the same as with drinking an espresso. Beautiful! So a great night all in all with some fantastic kegged beers. It’s all a matter of picking the dispense to suit the beer, and in this instance Thornbridge have got it almost spot on. Sounds great! Kipling is the only I've had on keg so far and it wasn't great but I think I caught a bad one. Very much want to try Italia (great in the bottle!) and Jaipur. I would love Thornbridge to include a permanent lager into their range. Was underwhelmed by Kipling but Jaipur in keg was immense when judging it at the SIBA craft keg event — love Italia, but only had in bottle (ditto with St Pete’s) so would be interested to see how it shapes out. Think a potential problem with keg might be everyone rushing to do one without necessary equipment and investment and then undermining the whole thing. Titanic stout on keg at the Bhurtpore in Cheshire is brill and so outsold an Irish stout (not the usual one) that it became a permanent I was told. Adrian -I'm a massive fan of titanic in bottles but not tried it on keg. I actually mentioned it in my last post when I was reviewing there iceberg wheat beer. Probably my favourite 'normal' stout. Mark - yeah Kipling doesn't really work on keg for me. It's a cask beer. Nice but when you've tasted Jaipur it just doesn't match up. I'd always be wishing Jaipur was on instead. It's a good beer, just not quite as good as the exceedingly high bar thorn bridge have set themselves! Great to hear. Out of interest, what are they retailing at compared to the cask counterparts? I've just been charged £4.35 for a pint of keg Brewdog Punk IPA in a pub where cask retails between £2.80 and £3.20. It was good, but I'm really not sure it justifies that premium. Keg should be cheaper but in my experience it never is! Thanks for the kind review, we all had a good time and North was in fine form. Thanks for commenting Simon. I think you guys do understand which beers work on cask vs which work on keg, but the most important thing is educating beer drinkers (and this includes Camra die-hards not just newbies) that keg is a great method of dispense when done well. It can actually improve a good beer when done right. 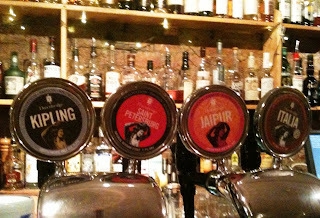 I love Jaipur, and it's never tasted better than on keg at North.